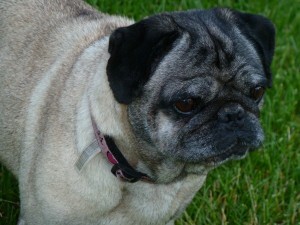 Juliet is a female fawn pug who was rescued from a shelter. She is undergoing a dental and having many teeth pulled for poor care. She will be spayed and available for adoption soon. We have renamed her to Sadie. She is a perfect angel. Such a sweetheart. She will always be near her mommy. Where ever my wife is, you will find Sadie. She has gone camping with us and loves being out there with us. From the moment we brought her home from living in the vets office, she has fit in perfectly.